Since the late-1980s the rise of the Internet and the emergence of the Networked Society have led to a rapid and profound transformation of everyday life. Underpinning this revolution is the computer – a media technology that is capable of not only transforming itself, but almost every other machine and media process that humans have used throughout history. Laid out in a clear and engaging format, Philosophy of Media provides an accessible and comprehensive exploration of the origins of the network society. It is essential reading for students of philosophy, media theory, politics, history and communication studies. "A much needed and highly savvy examination of the contribution of philosophy to our understanding of media, especially social media, with refreshing attention to ancient philosophers." 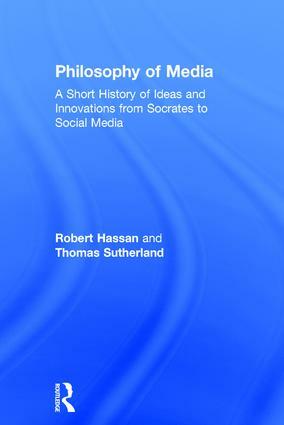 "Hassan and Sutherland offer a careful and lucid introduction to media as considered by philosophers over the centuries. The breadth of scholarship in Philosophy of Media is impressive, while the book also offers up some exciting and provocative thoughts about today’s society." Chapter 8 Technological Determinism: A social Science fiction? Chapter 10 End of Modern Politics? Robert Hassan is Associate Professor and Head of the Media and Communications programme in the School of Culture and Communication at the University of Melbourne, Australia. Thomas Sutherland recently completed his PhD in the Media and Communications programme at the University of Melbourne, Australia where he also currently lectures.